Just a quick one today. 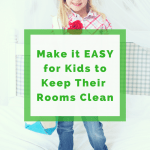 I don’t know about you, but getting my kids to clean their rooms is one of the most stressful and annoying things I ever have to do as a parent (although teaching my teen to drive is definitely in the top ten!). Sometimes it takes half the day, many times it involves screaming and yelling, and it’s usually a very unpleasant situation. But ya gotta make ’em do it. 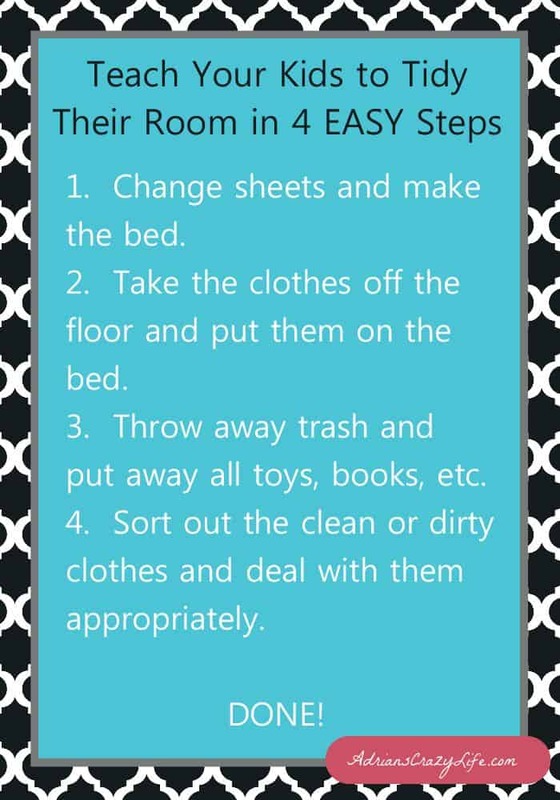 Kids need a somewhat clean room to be able to rest properly and to be able to find things when they need them. Tempting as it is to just let them just wallow in it. You aren’t doing them any favors. Because that inevitable day is going to come when they have an entire home of their own to keep clean. Then they may not know how to do it if you haven’t taught them. I ran across this magic formula somewhere on the interwebs. Recently, I tried it on my son Blake, who is 17 and going through a particularly ornery stage right now. I love that kid, but I think he is definitely responsible for at least half of my grey hair. But I had him try it, and surprisingly, it worked! His room was looking quite presentable in about 30-45 minutes. Both of us were totally shocked. Neither of us had to yell at all. It wasn’t a perfect job, but it was definitely as good as one of his 4-hour marathon jobs had been in the past! Now obviously, this isn’t going to be a fabulous, sparkling clean room. There’s no provision for vacuuming, dusting, or tackling the closet or drawers. BUT, it will be a room that they can walk through without stepping on stuff and some days, I would sell my soul for that! I love this magic formula and can’t wait to try it on my son! Thanks so much for sharing at Talented Tuesdays! Great idea! Thanks for linking up to the Blogger Brags link party. I’ve pinned your post to the Blogger Brags Pinterest board. I know, I was shocked that it worked so well on my teen. I’m going to try it again tomorrow just to make sure it isn’t a fluke. He’s off to a great start then. 2 is such a fun age – I miss those days now that I’m dealing with a grumpy teen. Ok, you must have known I needed this! I feel like a loser for not enforcing this with my 9 year old tween. She does these things but not on a consistent basis. This is simple and practical enough to get us going. Thanks so much! I hear ya! I was more strict with my older boys and they are turning out better than my younger one, who is the typical spoiled baby of the family. But I’m regretting it now that he’s 17 and trying to get a job. I feel like he is going to get fired at LEAST once a week with his lousy work habits (cringe). So keep on her and I hope this helps. I’ll have to test out this list on my three! Fingers crossed! Cool! Lemme know if you get good results with it. Thanks for sharing your tips at the #SundaysDownUnder linky party! I’ve pinned your post and shared on social media. My son is 15 and could very well be the cause of my early grey hair too! I will give this a try. Thanks for visiting. I’ve been enjoying your party and probably will stop by again tonight. I think people underestimate how tough those teenage years are and give the toddlers all the attention. I would take TWO toddlers with diaper rash to dealing with one teen for the day! Thanks for stopping by. Such a wonderful list! I love all your ideas and so simple too. Great for parents who want to get their kids motivated to clean this summer. Easy, and not overwhelming. Love it! Thanks! They say if you want to find the easiest way to do something just ask a lazy person. I love this formula! Great way to break it down and try something new. There is a new cleaning app for kids that has your kids put things away by color through spinning a wheel. My son was okay with it for the first little while but got bored with it when it seemed to be taking too long….maybe I should combine both of these methods! 🙂 Thank you. When my son was younger, I used MyJobChart.com for a while but I think they get bored with any approach after a while. I always marvel that these little people somehow turn into functioning adults who can manage a whole household. This is great information! We’ve been doing a lot of posts around chores for kids as well since parents are having such a hard time with that lately. So difficult to get them motivated. I love how simple and easy these steps are. I’ll have to share them with our parents and students. Thanks! That would be great. Little tips like this can make a big difference. Sounds great! I’m going to have to show my sisters this! One of them was just telling me the other day how bad her teenagers are lately! I hear ya! They really get lazy over the summer, don’t they? Hope this helps!